Brrr, its cold outside! At 12pm CT, temperatures are sitting in the 20's across Missouri, Illinois and Kentucky. Winds are gusting 25-30mph creating wind chills around 0°. We can thank this to an arctic air invasion. Along with it being cold, dry air is infiltrating the central United States. Keep the hand lotion and the chapstick handy! The dry air in place for the weekend is going to factor in to the chances for snow Monday. Moisture is expected to move in to Missouri/Arkansas from the southwest Monday. As the moisture falls from mid-levels, it will encounter the dry air. The drier air will act as a sponge and "soak" up some of the moisture. Don't be surprised to see the radars lighting up by early afternoon in central Missouri but most of the precipitation won't be reaching the ground. The other thing the dry air will provide is an environment for evaporative cooling. As the moisture falls in to the dry air and evaporates, it cools the air surrounding the moisture droplets. This will help drop temperatures to near freezing (32°F) by Monday evening. The big question is how much moisture will be left to reach the ground. Overall, models are trending slightly down in the amounts of moisture. Let's take a look at what some of the models are showing. -- I want to stress that the following images are NOT the forecast, but instead what computer models are showing. Here is this morning's global forecast model (GFS). 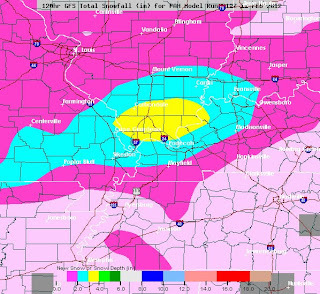 Taking a slightly closer look at the Cape Girardeau/Carbondale/Paducah area you can see how it puts a bulls eye over southern Illinois. Now let's take a look at NOAA NAM forecast model from this morning. You can see there are differences between the models. Also interesting to note is the new data from the European forecast agency's computer model and it is showing a little less moisture as does the RPM model. The way it is looking right now, here's how much snow we could see Monday/Tuesday. St. Louis metro - 1.5"-2.5"